From left: Sam Briggs, Byron Kuiter, Diana Packwood, Karen Ashton, Sarah Richards, Simon Markham. 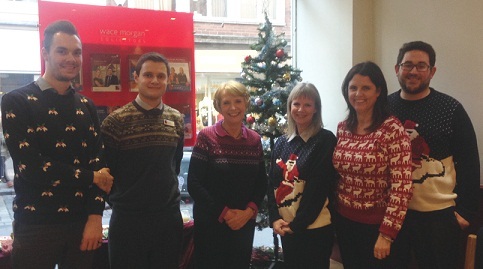 Staff helped to ‘make the world better with a sweater’ recently when they donned their festive knitwear. The teams at all four Wace Morgan bases raised a total of £80 for Save the Children by taking part in the charity’s Christmas Jumper Day. There were some colourful creations to be seen at our offices – and throughout the country – with the initiative meaning that a total of over £600,000 was collected for this worthwhile cause.